After a frustrating week of placings, it was great to salute the judge at Ballarat on Sunday June 2nd with our filly CHLOESTAR. CHLOESTAR is a three-year-old filly by Denon out of Classy Miss who is bred and raced by Graeme Ward and his wife Sue. Graeme has been a long-term client of the stable, we were lucky enough to train this filly’s half sister Ravishing Reward who was a Flemington winner and Spirit of Sienna who was also a city winning filly so it was great to be able to get this filly to the races and after a number of really promising runs to have the good fortune to find the right track and distance to win impressively at Ballarat. The stable would like to thank the owners G B Ward (Graeme), Mrs S R Ward, G B Ward (Glen) & The Two Teagues (Mgr: Mrs C W Teague) for their patience, the filly has taken a little bit of time, unfortunately she had an accident as a two-year-old where she injured her pedal bone and spent a long time at Springbank Farm in Shepparton. 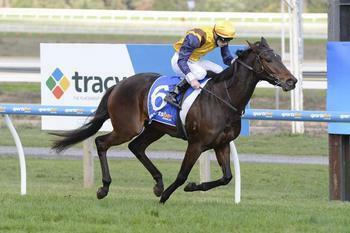 She came back in terrific order and we have gradually built her fitness and her confidence up and got to a distance we thought would suit her at Ballarat. From a wide gate, Jake Noonan gave her a lovely ride, just rolled forward, did not spend a lot of petrol doing so, led without being challenged and had a good kick in the straight to win comfortably. The Denons tend to revel in the softer ground so going forward I think she has a bright future at this time of the year. I would like to thank her strapper Jen Duffy for looking after her and the team here at Greendale for their efforts with the filly. Hopefully she can go on and win a couple more races this preparation and have a good chat to her fellow horses here to do the same!